To maximise power production it is vital that wind turbines are sited in an airstream which offers high velocity and low turbulence. 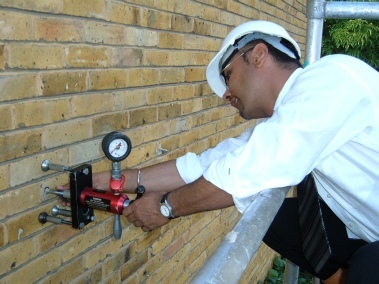 Mount height is the key variable open to the installer and the objective should always be to install the turbine as high as possible. This is particularly true of urban sites where the prevailing winds are slowed by other buildings. One obvious advantage of considering building mount is that it gets the turbine above the roof line of the building without incurring the cost or space implications of a freestanding tower. 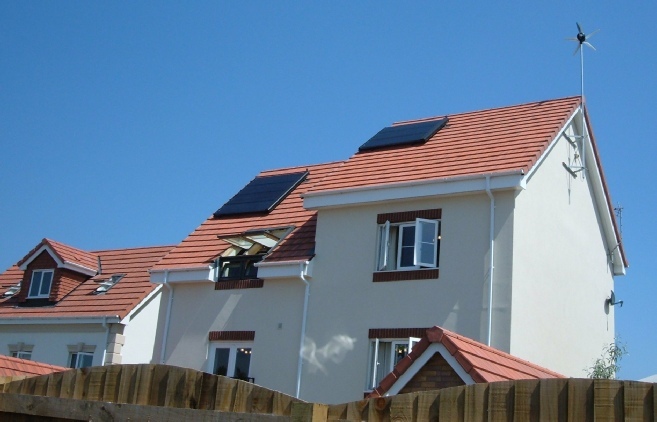 However, most buildings were not designed to handle the loads imposed by a wind turbine. For that reason micro wind turbines with rotor diameters of 1 to 1.5 metres are most practical for this application. 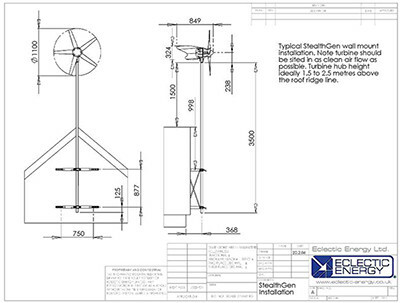 The Eclectic StealthGen turbine with an intercept area of 0.952 metre can be successfully installed on most building fabrics without the need for any remedial strengthening work. 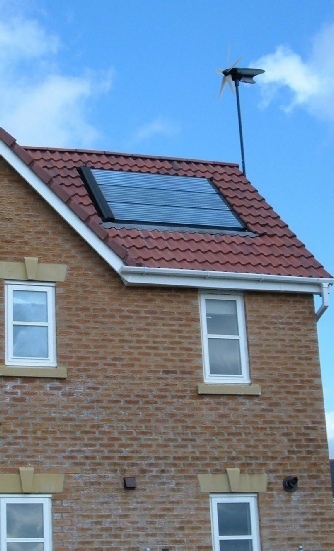 Eclectic produces purpose designed bracketry which allows mounting from a structural gable wall, and places the hub centre 1.5 to 2 metres above the ridgeline of the roof. As it flows over an obstruction such as a building, wind is compressed, causing it to accelerate. Such an acceleration zone is present at a rooftop, and can be used to good effect if the turbine is placed in the accelerated flow. Where a building’s ridgeline is perpendicular to the prevailing wind direction, multiple micro turbines can deployed along the ridgeline. Where turbines are to be building-mounted, it is vital that they are unobtrusive visually and very quiet in terms of airborne and mechanically transmitted noise. Mechanically transmitted noise or vibration is particularly unacceptable to the typical householder and some turbines are noticeably superior to others in this regard. MCS certification provides assurance that airborne noise and vibration levels meet a certain minimum standard. Eclectic’s turbines operate well inside these standards, which makes them particularly suitable for building mount applications.